"...Susan Abs was an integral member of the extended Vancouver 2010 Olympics Sustainability engagement and reporting team. She brought a balanced and professional approach to our annual Sustainability Report engagements despite increasingly tight time-lines and broad base of stakeholders. I can easily recommend her on future projects that involve a wide range of subject matter and a consistent and professional process. She listens well!" copyright Susan Abs, 2014. Do not reproduce without written permission. Eclipse Environmental designs, facilitates, delivers and evaluates cutting-edge initiatives to promote sustainability at local to global levels. Building on 30 years of experience in more than 20 countries, Eclipse works with local, provincial, federal and international organizations to implement practical, grounded sustainability solutions. We work with organizations to strengthen their capacity to implement environmental sustainability. We facilitate innovative, collaborative processes involving diverse stakeholders. 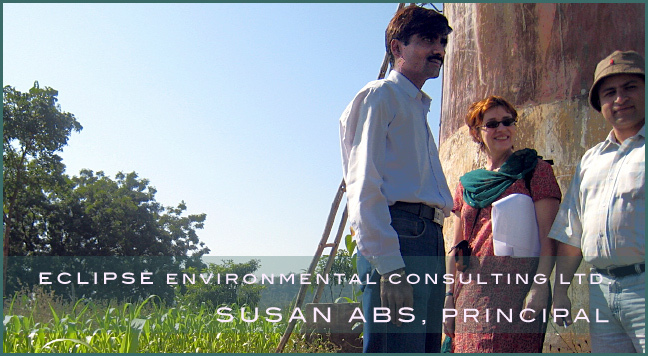 Susan Abs, founder and principal consultant, draws from an extensive network of colleagues to create teams that are tailored to each project and client. With solid experience in results-based management and strong organizational skills, we will focus on your needs and use your resources strategically.